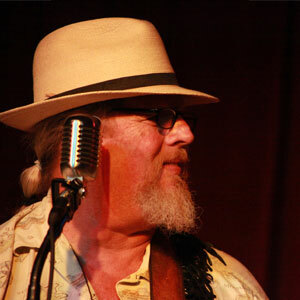 Graham Warwick brings a style of entertainment every bit as authentic as the blues music he plays to venues throughout the Texas Hill Country. Whether you’re looking for a rocking and rolling blues band or some laid back acoustic Americana, Graham can deliver the great tunes. While often Graham performs solo, many of his performances are in the company of some of the finest chops the Hill Country can deliver. His backing band, the “Sensational Bonafide Blues Band” takes on a couple of forms depending on the occasion, varying between a simple acoustic guitar/Upright Bass duo to a full on ten piece band complete with everything from harmonicas, to saxes, to alpenhorns (you really have to see it…). Solo or in a band, Graham keeps the blues alive, focusing on authentic, time-tested standards from the first half of the 20th century, with some really moving renditions on favorites such as the “St. James Infirmary Blues” and “What a Wonderful World”. However, some of his most popular tunes are ones that he’s written himself. Based out of Fredericksburg, Graham can usually be seen playing in places like Barriba Cantina in San Antonio, Azul Lounge in Kerrville, and various wineries throughout the Hill Country.